‘Project: Twilight’ again features the Sixth Doctor and Evelyn Smythe, continuing the run of high quality that these two have enjoyed under Big Finish’s stewardship. 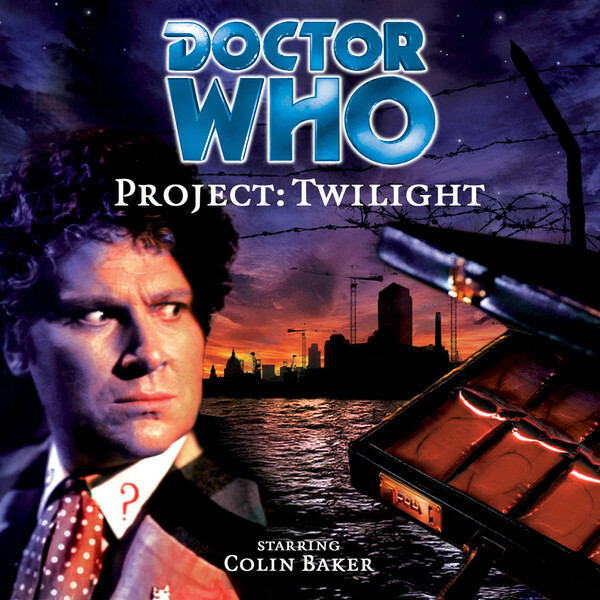 Prior to Big Finish, several novelizations featuring the Sixth Doctor put him into a contemporary setting, an approach that consistently yielded good results, and ‘Project: Twilight’ again exploits this trend to great effect. A series of animal carcasses that have seemingly been eaten disrupts the Doctor and Evelyn’s trip to the Slow Boat Chines Restaurant in South London, and the two soon find themselves involved in the investigation with little time before vampires are reintroduced, fortunately with a fairly fresh interpretation that doesn’t just follow the portrayals of previous televised and written adventures. More importantly, though, the plot is structured in such a way that the Doctor has to battle with his own instincts regarding vampires to consider the bigger picture, and this turmoil leads to some of the most emotionally effective scenes. It almost goes without saying, but Colin Baker is again on top form here. His Doctor is again afforded a script that allows him to show his intelligence and tenacity, and writers Cavan Scott and Mark Wright also do a great job in writing a Sixth Doctor who doesn’t always have firm control of the situation. Likewise, Maggie Stables also has some fantastic material and is closely involved with the progression of the plot this time out, returning to the forefront after her time on the sidelines in ‘Bloodtide.’ The banter and ease of conversation between the two leads is superb and continues to demonstrate just how comfortable this Doctor and companion have become with each other over such a short time period. It’s quite telling that both are quite obviously affected by the events going on, allowing each to explore a side of their characters that rarely has the chance to surface. ‘Project: Twilight’ also features a fantastic guest cast, each performance gripping and believable. Holly De Jong is great as Amelia Doory and, although it’s clear that her character is a treacherous one, her performance makes it easy to understand how the Doctor could be persuaded to think otherwise. Stephen Chase also offers a strong performance as Nimrod, a character with some obvious nods to the Blade franchise who makes an intriguing anti-hero who is set to return in future tales. Rob Dixon’s irredeemable gangster Reggie and Rosie Cavaliero’s Cassie complete the main guest cast, each confidently committing and lending credence to the unsettling and grim events at hand. And this is a very grim tale. With corpses drained of blood, exploding bodies, and threats lasting for several years, this is a very powerful story that shows the darker side of Doctor Who exceedingly well. This is all highlighted by an excellent and sinister incidental score from Jim Mortimore and Jane Elphiston. A heartbeat motif is present throughout, and occasional vocal harmonies accentuate the menace. It’s all quite subtle and rhythmic, but the end effect is a nuanced piece that fits the story perfectly and offers a nice contrast to the usual scores that try to match the 80s televised stories. The modern London setting suits the vampiric threat well, the atmosphere and score helping to heighten the tension throughout. With a tight script and strong performances, ‘Project: Twilight’ easily ranks among the better Big Finish releases, and it’s easy to see why a sequel is deservedly upcoming. It’s a notably shorter release compared to others, but the time it fills is time well spent, indeed.